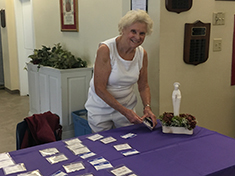 The Catholic Women’s Club of Christ the King Parish welcomes women of all ages to participate. 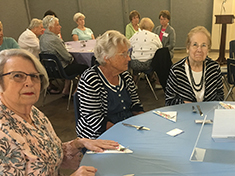 Members of the Women’s Club focus on its mission which is spiritual renewal, fund-raising for the parish, and social events throughout the year. 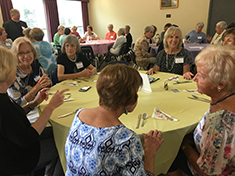 The Women’s Club’s monthly meetings and activities provide opportunities to meet new people, renew friendships, and participate in the vibrant life of Christ the King Parish. Members of the club are women who enjoy each other’s company while adding to the strength of our parish. Participation in the club provides opportunities for developing social relationships while pursuing individual interests and talents. 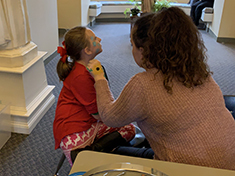 The club’s activities include meetings, social afternoon and evening events, a summer fair, a bake sale, an annual raffle, a Christmas bazaar, and combined events with other parish organizations. To become a member please click for an application, print the form, fill-out and mail to the address on the form or dropped off at the Parish Office. If you have any questions or comments, please go to “contact us”, all submissions go directly to the parish office. Please note: Applications must be returned by May 1st , 2019. 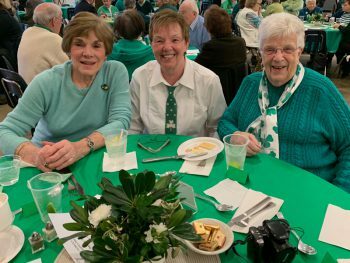 On Saturday night, March 16, 2019 the Catholic Women’s Club co-hosted a St. Patrick’s Day Dinner with the 50+ Club and the Knights of Columbus. The event followed the 4:00 PM Mass in the Parish Hall for 175 attendees. Catered by Chef Roland, the evening began with a social gathering hour featuring a lush offering of cheeses prepared by Teri Sweatman and the piano entertainment of Knight Joe Maloney. Numerous raffles prizes were available for bid and those whose names were drawn as winners near the end of the evening were delighted. Highlight of the evening was the four-piece Irish music ensemble that played for nearly the entire evening and brought energetic and talented dancers to the floor. To view all the photos from the evening go to St. Patrick’s Day. 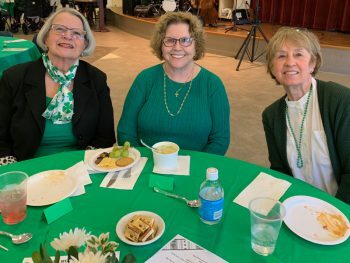 Nearly 100 members and guests of the Catholic Women’s Club gathered in the Parish Hall on Friday, March 1, for a Pre-Lenten Morning of Reflection given by Father Edward Healey, Pastor. The theme of the presentation was God, Is That You? In developing his topic Father used stories to teach and share the extraordinary and many ways that God speaks to us. He emphasized the subtle ways of God in response to our prayers and prayer requests. He emphasized that we must have heart and mind open to God as He can speak through dreams, thoughts, special experiences, other people, messengers. God communicates in signs; a rainbow, a flower, a song, a bird. What some may identify as a coincidence, can in fact be a God Incident. 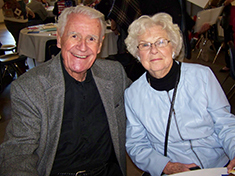 Through a series of fascinating stories Father Healey demonstrated numerous examples of how God had subtly responded in his life and in the lives of those in the stories he told. 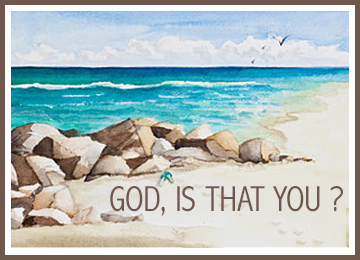 God does hear us and he communicates with us in many ways. We need to accept that we are not in charge; God responds to us and uses us in ways we do not and may never know. God is with everyone of us! Thank you, Fr. Healey for reminding us to listen and be aware of God in our everyday lives. 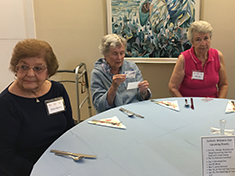 On Friday, January 25, 2019 members of the Catholic Women’ Club gathered for an afternoon of relaxation and entertainment to view the popular film The Greatest Showman starring the talented actor Hugh Jackman. 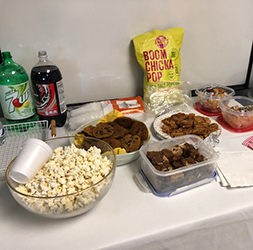 The movie was shown at the Parish Center and members enjoyed refreshments and the raffle of a gift basket which included movie tickets among other entertainment related items. 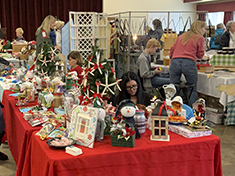 On Saturday, December 1, 2018, the Catholic Women’s Club hosted the Annual Christmas Fair from 9 AM – 3 PM in the Parish Center. 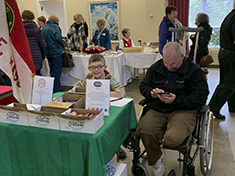 The event was the culmination of many hours of preparation by many of the Club’s dedicated members and the result was a wonderful shopping experience for all those who attended. 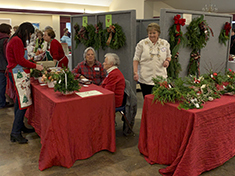 The Fair featured numerous crafters, beautiful jewelry, cash and gift raffles, fresh greens wreaths, door hangings, table arrangements, and boxwood trees. The boutique had lovely gift baskets and assorted items for sale and the homemade baked goods offered for sale were many and scrumptious! 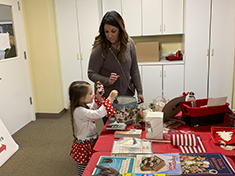 The Children’s Shopping room was bustling all day and the Holly Café provided a delicious respite for hungry shoppers to stop and sit for a while and enjoy the offerings of the café. 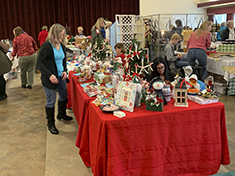 The Christmas Fair is a major fundraiser for the club’s scholarship awards program. Our thanks and appreciation to every person who helped in any way to make this special day a success! On Sunday, November 11, the Catholic Women’s Club hosted a Veteran’s Appreciation Luncheon in the Parish Hall following the 10:30 AM Mass. As guests gathered they were greeted with the festive tone of the patriotically decorated room and an array of sumptuous hors-d’oeuvres. 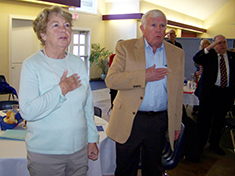 Club President Gail Reilly welcomed the attendees and thanked the veterans for their exemplary service to our country. Following the grace, offered by Father Healey, all enjoyed a wonderful meal catered by Chef Roland. The afternoon was graced by the presence of Donny Nolan and members of the parish adult choir who honored each branch of the service with their respective song and also led the group in singing other patriotic favorites. The highlight of the event was a video presentation developed by Judy Warren. Set to ‘I’m Proud To Be An American’ playing in the background, the video shared a poignant collection of veterans in action throughout the years but most impressively included photographs of a number of our own Christ the King Parish veterans. To say that there was not a dry eye in the house would be an understatement. 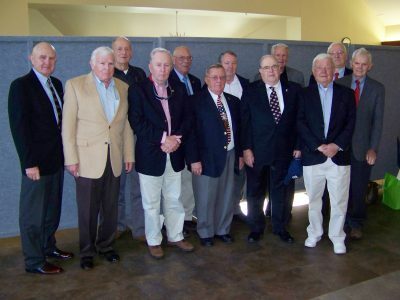 As veterans who were present received back the photos that had been submitted for the video, conversations about their many memories were sparked. To view more photos from this event go to Veteran’s Day 2018. THANK YOU TO ALL OF OUR VETERANS FOR PROTECTING OUR FREEDOM! 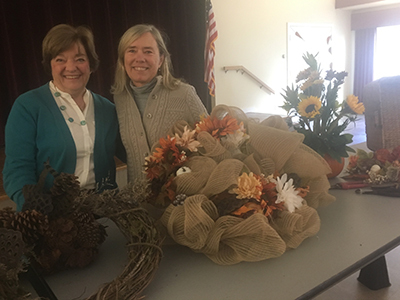 On Friday afternoon, October 26, Catholic Women’s Club President Gail Reilly welcomed approximately seventy-five members to the Parish Center and a program that included a presentation on the St. Vincent dePaul Food Pantry and other outreach activities, a baby shower, and a hands-on presentation about Autumn decorating Cape Cod style. Following an opening prayer, Gail reviewed the upcoming monthly programs planned by the Club. Gail Reilly then introduced Gail Walsh who presented a brief overview of programs sponsored by the St. Vincent dePaul Society. Mrs. Walsh spoke about the weekly Food Pantry which operates on Wednesday mornings and one Wednesday evening each month and provides food for several hundred families each month. The Needy Case program assists families with need in a variety of ways that extend beyond simply providing food. Finally, Gail Walsh explained that the St. Vincent dePaul organization supports the efforts of the Baby Center in Hyannis, operated by the Council of Churches, by providing diapers to families with infants and toddlers locally. As part of the afternoon’s program Club members had been asked to donate diapers and baby wipes along with other vital infant and toddler needs and thus the Baby Shower. The response was magnificent and Mrs. Walsh was extremely grateful for the generosity of our members. 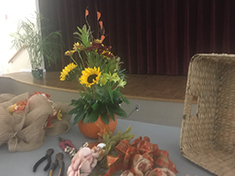 Gail Reilly then introduced Susan Dewey whose presentation was a hands-on demonstration of making Autumn Wreaths and Swags. 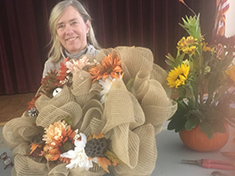 Susan is a Garden Club of America judge in floral design and current horticulture chair of the Osterville Garden Club. As she created each item, Susan taught some very insightful ways for members to replicate the work at home. 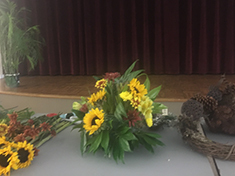 The works she completed for her audience were stunningly beautiful and several of our members took them home as winners of the afternoon’s raffle! 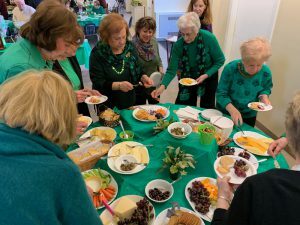 The program ended with many delectable desserts to choose from, along with coffee and cider, and plenty of time for members to spend time with each other. A lovely afternoon to remember. 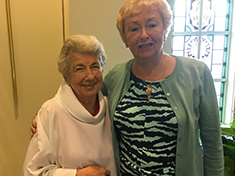 On Friday, September 14, the Catholic Women’s Club inaugurated a new calendar year. 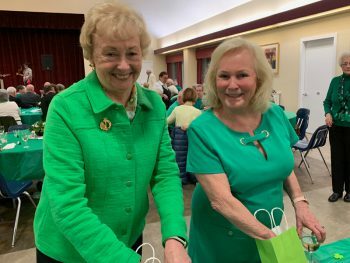 Following Mass, members gathered in the Parish Hall and were greeted by President Gail Reilly who welcomed new members and welcomed back returning members. Gail reviewed the upcoming programs planned for the year and introduced Dottie Hiltz, Christmas Fair Chairperson, who spoke briefly about the Fair and encouraged members to use the sign-up sheets on the tables to volunteer. President Reilly then introduced Father Healey who graciously agreed to donate his famous meat pies to the Christmas Fair if he could recruit 4 or 5 volunteers to assist in their preparation. 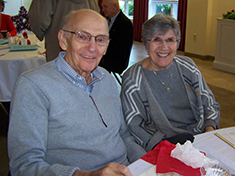 Following the grace, led by Father Healey, members enjoyed a buffet luncheon catered by Laura’s Home Cookin’. On Sunday morning, June 10, 2018, members of Christ the King Catholic Women’s Club gathered for their Annual Meeting at the Coonamessett Inn in Falmouth. Following a welcome and blessing by Reverend Deacon Robert Lemay attendees enjoyed a sumptuous brunch. 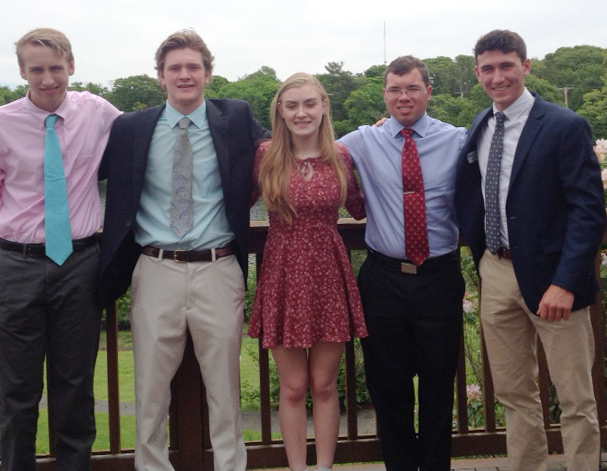 The Annual Meeting began with the presentation of six college scholarships to graduating high school seniors who have been actively involved members of Christ the King Parish. The outstanding scholarship recipients were Justin Bernier, Ilya Boyd, Michael Burke, Myranda Goveia, Hannah Laird, and Joseph Papapietro. The presentation of scholarship awards was followed by the installation of club officers conducted by Reverend Deacon Robert Lemay. Installed as officers were: Gail Reilly, President, Suzi Rego, Vice President, Carol DeVincent, Recording Secretary, Maddy Hooke, Corresponding Secretary, Joanne Coletti, Treasurer. 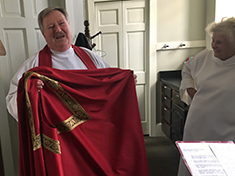 On behalf of the Pastor of Christ the King Parish, Reverend Edward Healey, Deacon Lemay then accepted a donation to the parish from the Women’s Club. Father Healey had earlier expressed his thanks and appreciation to the club for its tireless efforts, commitment and support of the parish. The program concluded with the outgoing Catholic Women’s Club President, Teri Sweatman, expressing her appreciation for the opportunity to lead the group for the past two years and most especially for the assistance and encouragement she received from members of the Board and membership of the club whom she encouraged to remain involved and participative in the ongoing activities of the club. 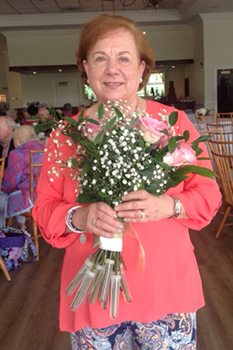 Mrs. Sweatmen was presented with a stunning bouquet of roses as the gathering ended.